The most asked questions I get are “how to avoid being scammed by a supplier” or “how do I make sure this supplier is legit? To be honest with you the easiest way to make 100% sure is to go visit the factory but I realise that most of you won’t be able to do so. The goods news is there are ways to figure out if a supplier is legit or not without going to China. The bad news is that some of these options will cost you some money. Here are my four proven ways of researching a supplier. I will go into detail for each one of them. A factory audit is where you hire a Third-Party Inspection Company to conduct an audit at the factory’s facilities. This way you can make 100% sure your supplier is legit. Be aware that not all factories allow you to perform an audit at the location which is in turn already a huge red flag. If they are willing to undergo an audit straight away it is a good sign already. You don’t necessarily need to perform an audit but announcing to a supplier before you order that you will conduct an audit already gives you some idea on what your supplier is up to. Lets take a look at the procedure when booking a factory audit. There are many Third-Party Inspection companies out there and I mention them in a few posts (TUV, SGS, Bureau Veritas etc.) but I always use Asiainspection because they are efficient, cost effective and reliable. There are companies out there who charge half the price but you don’t have a convenient interface/dashboard online that lets you do the booking trough their system. Most of the cheaper Inspection Companies have only email/phone conversation bookings available. 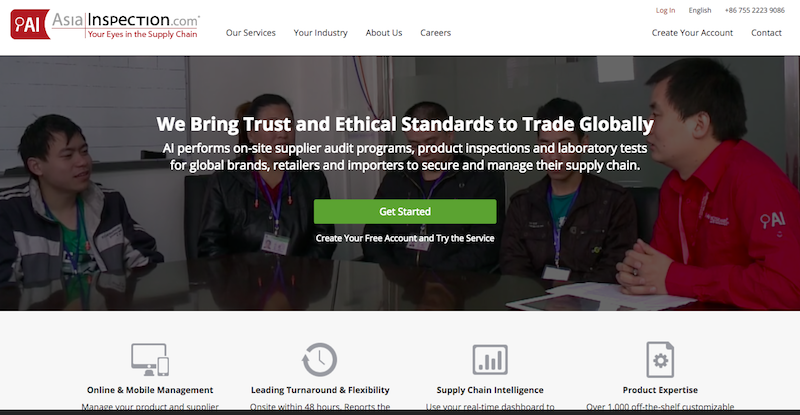 Lets take a look at how you can book an audit with a factory online trough Asiainspection. Next thing is you need to start inputing general information such as your reference, the requested audit date etc. You also need to let them know if this is a first audit or re-audit. Then they will take extra care for issues that you can input later. In the next mask you input the factory’s detail, contacts and addresses where you want the Inspector to go. The system also stores this information and makes it easier for you next time you want to audit or book some inspection at this factory. The next step will be crucial to what you want to have audited. The system already suggests the 5 most popular fields. Provides general information about the factory. This section includes a report on the workflows at the factory, as well as a chart of the factory’s organisation. This section includes a calculation chart of the overall production capacity, as well as an output check of the production lines running during the Audit. This section includes a review of the machineries and equipment tools. The section includes an assessment of the internal quality processes, QC facilities, quality team, records and quality certificates. You can click on previewing any of the fields and you’ll get a more detailed info on what they audit. When you click on “preview” another window opens to show you a sample report of this particular field. It looks like this and you will see what you get audited when you click on this field. Pretty straight forward. You can also choose a preference from 1-5 for each field meaning they will pay more attention to “1” than “5”. You can add more options such as “Social Accountability, Procurement Conditions” etc. but I recommend you go with the first five and most popular options. Then you can give Asiainspection specific requirements that you would like to have looked at from the Inspector. I have added a few sentences in there but you can basically instruct them anything you want. After reviewing all your information you can confirm and the check-out page will pop up. You can choose to “pay now” or “pay later”. The latter will have a 5% surcharge on top. You are all set. Asiainspection will contact you & the factory briefly to confirm all details. From now on they will arrange the audit with the factory directly (trough the contact details you provided). Just to make sure, let your factory know that you have arranged for an audit. I admit the price (629US$) is pretty steep and it only makes sense to perform an audit if you have larger orders and continuous business with a factory. Another reason could be that the factory you are planning to order from is the ONLY factory producing the item you are looking for but for some reason you have a feeling you would rather have the factory audited or inspected before placing an order. Based on the audit report a factory actually also can benefit. The audit points out things to be improved from the factory’s side and it will help the factory to get more customers if they are audited by a Third-Party. You could even ask your factory to share half of the costs and pointing out to them that they will benefit from this audit in any way. There are many other services that you can conveniently book trough Asiainspection such as Shipment Inspection, During Production Inspection etc. starting from 309USD. Alibaba research is free of charge and these days it is quite safe to manoeuvre on Alibaba. Alibaba itself works constantly on improving buyer’s safety and trust. Does their assortment match up? Meaning do they have many different categories that are suspicious or don’t make sense? Is the address a small office address or an actual road address? If a factory prides themselves with a turnover of 10MilUSD and their address is for example: Room B, XYZ Office building, something is off. Third party assessment reports (like the audit above). You can get copies of the reports that Alibaba saves on its database and you can look into the reports. These filters help a lot already. Be weary of non or 1-year Gold suppliers. See if the supplier has been checked by Alibaba or if they offer Trade Assurance. If for example a factory does not have any of the above checks I would be very suspicious. Because why wouldn’t they want Alibaba or a Third-Party to inspect their facilities? Simple, they know they would be uncovered as either an expensive agent or a scammer. Check out above post on Alibaba hacks and look at the screenshot I made. Another free option is to look at certificates & reports from factories. If your factory is neither on Alibaba, Globalsources or any other supplier directory you can still check their reports. Their latest factory audit report from any other customer. If they haven’t had an audit yet ask why. If they can provide you a report scan trough it and look for anything unusual or critical. RoHs certification is necessary for most European countries & the Americas. It prohibits certain hazardous material within the product. FCC is a required certification on electrical products & also a standard for the US. If they do not have any certification, approvals or even audit reports is its a VERY bad sign and you should stay away from this supplier. 1) Because they are not interested in developing any business with overseas clients and are only after quick and easy orders (most likely South East Asian customers who don’t care about certification). 2) Because paying for an audit or having your products certified costs time and money. Reliable & customer oriented factories do not shy away from making these investments. Scammers, un-reliable factories don’t even want to bother. They probably won’t even answer your email with your inquiry in the first place or they write something back that I received quite recently from a factory that i knew was up to no good: “We don’t do business with Hong Kong company”. They realised I know my business, because I requested a couple of things in my first email to them. I am not saying overwhelm your supplier with questions and requests in your first email but find a fine line of what you want to have from your supplier in the beginning. Still not convinced of your supplier? Something off in your conversations? This research option is free if your supplier has Skype and most suppliers usually do. Request a video call with your supplier and prepare yourself with a few questions. Ask anything that would make you feel more comfortable in working with the supplier. Ask about the factory, how many workers, etc. Basically anything that gets the supplier answering your questions so that you can develop “a gut feeling”. Ask them to show you the sample (of your interested product) in the video call. If he doesn’t have a sample in hand, arrange another time for a Skype call. If he refuses or finds some excuses you will quickly see that something is off. Even with many years on my back in this industry I can’t always know for sure that a factory is legit or not trying to scam me. Unless of course I send an inspection or go to see the factory myself. Now I would think twice ordering from this factory but apparently everything went well (this time). It’s like in poker. You have a certain amount of “tells” available on your opponent and depending on how he makes his moves, you call (place an order) or fold a hand (eliminate the supplier). Even when you know you did all you can do to protect your money sometimes there is no guarantee you can win, but having the above tools and research options available you can at least make a decision knowing you did your best. Versteh ich nicht ganz 🙂 Schick mir doch eine email zu deinen Fragen. Thank you very much for all your help. I really mean it. danke für deine unglaublich hilfreichen Blogpost. Bzgl. Skype: Meine Supplier wollten bisher nicht mit mir via Kamera skypen. Ich kenne das aus meinem alten Job von indischen Entwicklern. Meist ist die Ursache kein “scam”, sondern, dass sie nicht besonders gut Englisch können. Wie ist da deine Einschätzung? Skypst du mit allen Suppliern mit Kamera?